"Wonderful Ambience, Beautiful Surroundings, Awesome Breakfast, Top-Notch Service!" Cranmore Mountain Lodge is your home away from home, an affordable escape any time of the year. Unlike many hotels in our area, our quaint New Hampshire Country Inn is located away from the busy roads and traffic noise yet close to North Conway Village’s numerous restaurants and shops, 1 mile from Cranmore Mountain‘s slopes and Adventure Park, 15 minutes from StoryLand and Attitash Mountain, 35 minutes from the Mt Washington Auto Road, and only 5 miles from Settlers’ Green tax-free shopping outlet stores. You can arrive in time for complimentary homemade cookies and afternoon tea/coffee (late check-in is also available) then relax before dinning at one of many independently owned restaurants in the valley (we will gladly share with you our favorite places to go within 5 minutes drive from us), enjoy our quiet backyard and our pond stocked with trout (you can catch and release), then wake up refreshed every morning and join us in the dining room for our gourmet cooked-to-order breakfast (made with locally grown ingredients whenever possible) offering choices such as stuffed croissants (sweet or savory, our own home recipe), French toasts (the real ones: we are coming from France! ), Pancakes, Omelets and more, is served each morning and is included in our rates. Featuring all the charm of a historic country Inn built in the 1840s, Cranmore Mountain Lodge features 20 uniquely decorated guestrooms (dog-friendly rooms available), all smoke-free, four of which are suites (two with kitchenette), and all have private bath, cable television, WIFI, individual A/C, and phone service. 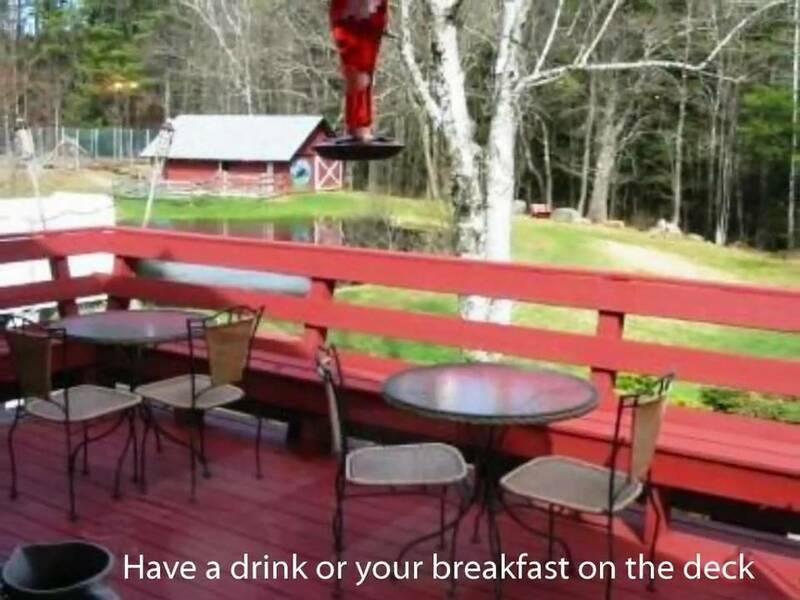 Whether it is for a short break or a week long vacation, for a romantic weekend or to spend some quality time with your family, you can really relax and unwind at Cranmore Mountain Lodge while doing all the outdoor activities you like right at our doorstep. We pride ourselves in offering a top notch New England hospitality. Welcome to our home! For a complete and accurate list of our year round and seasonal special offers, please click here. Massage Wellness Package - From March to end of June, and from end of October to end of December. Attitash/Wildcat Inclusive Value Package - Great value to ski the most vertical slopes in New England !